St. Martin's Griffin, 9780312270155, 288pp. Guided by the fastidious journals of an eminent Victorian adventurer by the name of Lord Dufferin, Time Moore sets off to prove his mettle in the most stunningly inhospitable place on Earth-the Arctic. Armed only with his searing wit, wicked humor, and seasickness pills, our pale suburbanite-wracked by second thoughts of tactical retreat-confronts mind-numbing cold, blood-thirsty polar bears, a convoy of born-again Vikings, and, perhaps most chilling of all, herring porridge. When he is not humiliating himself through displays of ignorance and incompetence, Moore casts a sharp eye on the local flora and fauna, immersing readers in the splendors and wonders of this treacherously beautiful region. 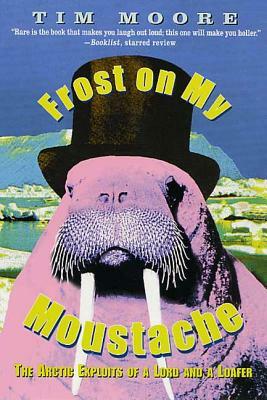 A deliciously and inexhaustibly funny book, Frost on My Moustache deserves to be placed alongside those by Evelyn Waugh, Eric Newby, and Bill Bryson.